This is a Portuguese recipe which will work for anything you’d serve potatoes with. 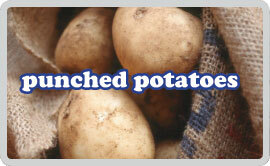 It’s also a great way to vent your day’s anger as you literally do “punch” the potatoes. Not hard enough for my liking. We had it with some chicken and chorizo. Another triumph! Pierce the potatoes all over with a fork and place on a baking tray. Bake in the oven for 1 hour or until tender. Remove and let cool for 5 minutes. The with a clenched fist (and a face of someone you hate at work in your head) give each potato a firm punch in the centre to break the skin. Arrange on a plate and sprinkle a little garlic and red onion into the potatoes. Drizzle over some olive oil, salt & pepper and a little white wine vinegar and serve.